While some networking events are large in scale, designed to connect businesses and people, others can be significantly smaller and lend themselves to more of a one-on-one interaction. As a business owner, I realize how valuable networking opportunities are — not just as a way to identify new business leads for my company — but also to align myself with like-minded individuals that I can learn from and share my own expertise with and as a way to become more familiar with the community. Networking is key to establishing visibility for you and your business. If you make it a priority and a consistent practice, it will enable you to establish your own “circle,” build alliances with potential partners and clients, and even make some friends along the way. Once you’ve done that, it’s important to treat these connections as reciprocal relationships and also as a chance to see what opportunities you can seek together. To truly be successful, networking should lead to some form of collaboration. Good advertising doesn’t have to always be bought; sometimes the best referrals come from acquaintances and those who trust the services you provide enough to pass your name on to someone else. 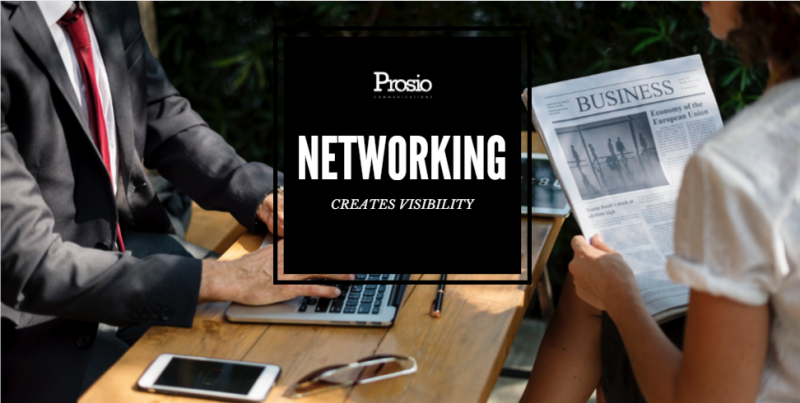 Attending networking events provides consistent opportunities to meet new people, gain exposure to new ideas and connect with individuals within your business community. Whether it’s an industry event, a local chamber meeting or a government update on events happening throughout your city, there are opportunities wherever there are professionals. It’s also important to remember that networking is so much more than just meeting new people. It’s a conduit to stay informed on what’s going on in your community and within your industry. It also provides the opportunity to stay connected with those you’re already acquainted with, keeping you both top of mind for future collaboration. Networking immediately after an event or engagement also is crucial. Review all the business cards you received and email individuals while they remember meeting you and while the context of your conversation is still fresh in both your minds. But don’t stop there. You should think of networking as actively fostering a relationship, and like any relationship, it requires maintenance. Suggest a coffee date, schedule a lunch or happy hour meeting, or send along a quick “plus-one” invite to a seminar or another event that you’re attending that may be of interest to your new contact. This also is important to do with your most established connections – it takes two parties and some effort to make a business relationship work. Proactively reaching out can help maintain a connection and reaffirm your interest in further building a relationship. Networking should be a constant act of engagement for you, your business and your staff. We are all busy, and sometimes networking seems more like a chore, but making it a priority can benefit both you and your business. Networking enables you to socialize with others in the business community while providing a mutually beneficial exchange of services, assistance and increased connections. It can provide both parties with future opportunities for business pursuits or continued access to a valuable resource and ongoing advice. Think of networking as an investment in your business and professional career. The more effort you put in, the more likely you are to net a sizable return. A version of this article originally appeared in the May 26, 2017 edition of the Sacramento Business Journal.